I remember Janet, my therapist at the time, saying those words to me over three and a half years ago. I simply couldn’t sit still. I had so much restless energy and I didn’t know what to do with it. I would move my hands, I’d shake my legs, I’d get up and walk around in the middle of talking to her. But finding the gift of meditation was something that helped change my life and literally rewire my brain. Fast forward to today and I’m a different person as the result of my meditation practice. Every morning I meditate for 11 minutes and about 5 times per week, I meditate for ~30 minutes in the afternoon. I am calmer. I am clearer. I am able to handle stress better. Simply put, I am a better person as a the result of my practice. I can’t even sit still when I’m talking to someone, how the heck am I supposed to sit still and meditate? I have ADD which means there is no way I can concentrate! My mind is constantly racing, how am I supposed to clear it and not think of anything? I’m SOOOO busy! How am I supposed to find time to sit and down and do NOTHING? These were all lies I was telling myself. A lot of this is just about getting started. Letting go of your thoughts that meditation has to be perfect and comfortable right from the start. It doesn’t. Meditation is no different than anything else in life. So much of it is just about showing up and creating a practice, something that works for you. Something that you can continually improve upon (slowly). I don’t believe that you have to follow any rules for meditation. In fact, I think that’s what holds so many people back from even attempting it. This thought of a rigid practice. Notice that it doesn’t say “to sit perfectly still with a straight back and your hands in Buddhi mudra and your mind perfectly still”? No. It’s simply about connecting with your true self and there are many ways to do this. 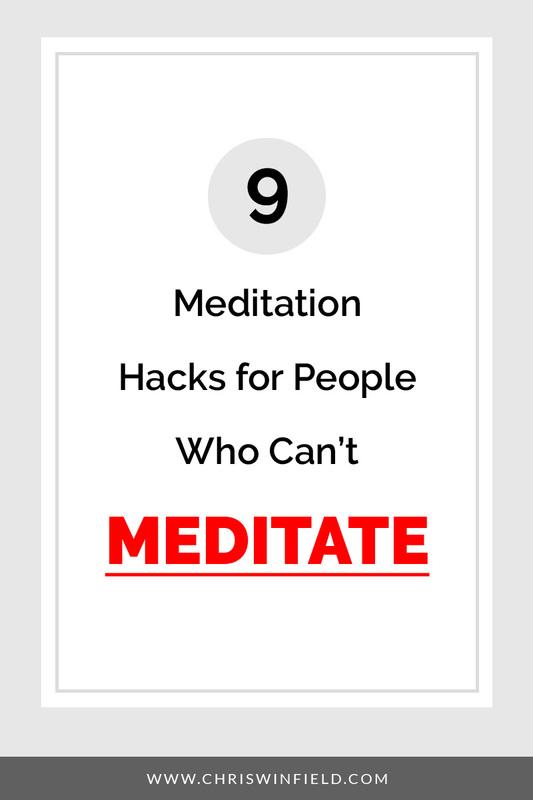 Here are 9 meditation hacks to help you start (or enhance) your meditation journey…. Close your eyes. Sit up straight (wherever you are is fine). Smile. Take a deep breath in through your nose and silently count to ONE. Slowly let that breath out through your nose and silently say TWO. Repeat this until you get to TEN. Sounds pretty easy right? I still have trouble getting up to ten without my mind wandering. And that’s just fine. Meditation doesn’t have to be motionless. Walking meditation is a form of meditation in action. You simply focus on walking. Go outside and take a walk and just have the actual walk be your focus. Don’t pick up your phone and text people or use this time to call someone. No. Simply walk and take in the beauty around you (wherever you are, there is always beauty that can be found). Simply spending a few minutes petting an animal can be a very relaxing and calming activity, especially when it’s done mindfully (when you’re focusing on the activity rather than while you’re doing something else). There is a two-pronged effect whereby your touch calms the animal and at the same time, releases feel-good endorphins in you, reducing your heart rate. Don’t have a cat, dog or horse to pet? Even spending a few minutes watching fish swim will help you feel less anxious and less stressed. Research has shown that your body actually goes through physical changes in that time that make a difference in your mood. The level of cortisol, a hormone associated with stress, is lowered. And the production of serotonin, a chemical associated with well-being, is increased. I made a quick start guide to help you practice these meditation principles. Go ahead and download a free copy by clicking the image below! I used guided meditations over 50% of the time when I first started. It helped focus my mind and I thought of them as my “personal trainers” for meditation. This site offers a wealth of guided meditations from different teachers and on many different themes. Download them all for free or stream them directly. 60 seconds. 90 seconds. 180 seconds. One of the biggest issues I had early on was thinking that I had to sit and meditate for at least 20 minutes or it didn’t count. Looking back I’m not even sure where I got that twenty minute number from. So one of the ways that I overcame this was by simply sitting and meditating (if you could even call it that) for 60 seconds at a time. I figured that I could do anything for 60 seconds. And I was right. Once I got relatively comfortable with that, I’d increase it to 90 seconds. And then 180 seconds. I like to think in terms of seconds. Seconds were mentally achievable. Close your eyes. Sit still. Now open up your floodgate of thoughts. Don’t even attempt to not to have thoughts. You won’t be able to. Instead let them come and simply observe them. Even better, treat them like leaves falling from a tree. Watch them simply float away. Don’t get attached to them. By embracing your wild thoughts, you take away their power and you can simply just be. A big part of meditation for me is simply disassociating with some of the clutter in my mind. It gives me that space to change. Another great way to do this is to simply pick up a pen and grab a piece of paper and JUST WRITE. I’ve talked about this before with the benefits of the morning pages but this is even simpler, quicker and can be done at anytime of the day. How can I find more time to work on my manuscript? Get it out. Get some space. My wife and I have a great relationship and a big part of that is because we are very different people. I hate driving. She enjoys it. So whenever we go somewhere together as a family, she is always the driver and I sit in the passenger seat and read or write (like I’m doing right now). One day I asked her how can she stand to drive all the time? And her response was really interesting to me. It doesn’t matter how long the ride is or what the situation is (traffic, no traffic, rain, irate drivers, whatever) I can look over at her and her expression is pretty much always the same. No radio on. No distractions. Just enjoying the drive. Do you want to make sure you keep up with your meditation practice? If so, grab a free copy of my quick start guide below. It will help enhance your journey toward inner peace and spirituality. Click the image below to get one right now! Gratitude is one of the most powerful emotions that we can experience. I’ve talked before about how gratitude changed my life and it’s something that I practice and live every single day (no matter what else is going on). It’s a way to step outside of yourself for a bit and a great way to slow down. Simply sit down and say “Thank you.” It doesn’t matter what your beliefs are, just say “Thank you.” It doesn’t matter if you say it out loud or silently. It doesn’t matter who you are actually saying it to. Just say it. And then say it again. And again. Really feel and mean those words. Then you can progress into thinking about some of the specific things that you are grateful for in your mind. And from there, everything becomes a possibility. I felt the same way Chris. Mind racing…how do I stop it? I stopped trying to stop it. I imagine clouds, which is what I have done since I was a kid when I was stressed out. I would look up at the clouds and watching them would calm me down. The Beatles had a great interview where they were asked about their trip to India and what meditation was exactly. They said it’s not magic or anything. It’s just a system of relaxation. This statement made it easier for me to tackle it and is what made me start the practice. They said it’s not so serious and explained it as if it were as simple as breathing, which is what it is. Just breath. I have read a few books that guide you and teach different patterns of breathing to achieve different goals and have tried them. I end up going back to just the normal breathing. It’s the most calming for me. I enjoyed this article! It nicely shows that meditation is not something too difficult and that it is accessible to anyone. I’ve been meditating for the past three years, and I think it has changed me too. I am much more able to see my thought patterns than before, which helps me choose how to act in troublesome situations. It gives me some space and some peace of mind, and often it also feels good. It can sometimes be difficult to get to practice because it can be a bit daunting to sit for 30 minutes; sometimes I simply want to do something else. If I feel that I really don’t want to practice today, I sometimes let myself do something else. But I do my best to meditate the next day in order not to disengage from my practice. I find that meditation comes naturally to me in a way since I am a contemplative person who likes quiet. It is disconcerting to see all the thoughts floating around in my head, but the benefits and the improvement in my mood are stunning. Great thoughts Mariya — thanks for sharing! Yeah I was a classic overthinker as well Byron.. Try to let go of any preconceived notions or expectations and just jump into it! Great article. My mind is racing all the time. I’ve been wanting to start meditataion for ages. High blood pressure has made this a top priority for me now. Like the simple steps you describe. I too am victim of overthinking. Time for action!!! Action is almost always the answer Keith 🙂 Please let me know how it goes! I’m definitely a meditative driver as well. I have also found great relaxation in watching fish swim. And of course through serious exercise. That is truly when the chatter stops. Great article. Awesome Leo — let me know how it goes! Check out: http://www.owcenter.com/services.php/flotation-tank There are similar things in other cities. 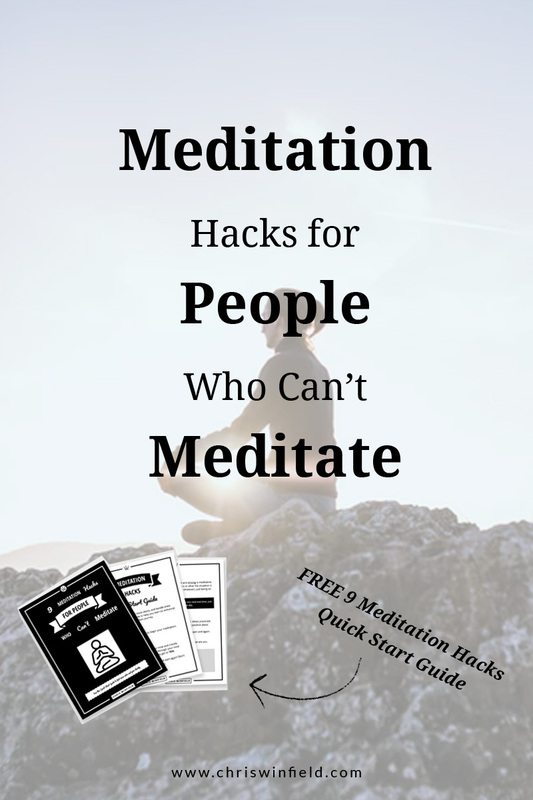 It gives you a shortcut to ideal meditation state in which the “hacks” could be employed. From what I understand it puts you in a mode which normally takes years of meditation practice to achieve. That’s really cool Brad — thanks for sharing! Great article Chris! Meditation was a game changer for me. I always got distracted by many thoughts and almost all the time when I was playing with my daughter. Since I learned how to “gently come back” when my focus goes away I’m able to focus fully on my kids and wife when I’m with them. As I use Headspace app – guided meditation, I think I have to make the full session to make the full impact. But you reminded me that even 30 seconds count. I’ll focus on it to meditate also during the day and become more focused and present. Thanks for that! Chris, I just found your site and I’m going to copy and paste your ideas. I hope they work. I too have ADD and have spent years off and on trying to learn to quiet my mind to focus and meditate. My brother was ADD too and he learned to meditate so I knew it was possible. But have never been successful. To make it harder, I have a ringing in my ears that adds to distraction. Helpful article, I havent been able to meditate though. Im just not a believer of this yet. Fighting health issues, sleep issues and a bit of anxiety this was suggested (meditation) could help. So Im willing to try, but I feel I cannot focus. Ugh… why can’t anyone just give me a straight answer about how to meditate? Are clear, straightforward instructions really so much to ask for? Love the article, thank you. I’m trying to get myself into the habit of meditating and been practicing it for a couple of weeks now. How do I know that I’m actually doing it? What does it feel like? Thanks for the great information Chris am applying it daily and feeling so much calmer! I love this article! Very straight-to-the-point. I have been searching for alternatives. Thank you for Chris. I have very little time alone, these are very helpful. Hi Marie. Maybe you’re trying to hard all together? I use to get super frustrated and felt like my meditations weren’t working when I couldn’t see any images or colors, or feel sensations. But it’s better to just sit and be aware. If you cant think of what the guided meditations are telling you to imagine, just be present. Think of how youre sitting in a room or outside. Spinning on this tiny blue dot in the middle of space. Think of your surroundings, maybe even listen to them. The more you’re present in your meditation the more you will find it is easier for your mind to open up. You should also looking into clearing your chakras! There are a bunch of YouTube videos on how to cleanse and restore them. That might help a lot too. But I hope any of this advice leads to improvement on your meditation journey. Much love. This is wonderful post. Just want to say Thank you.I hope to get better at meditation with these tips. I have a hard time meditating. But when I do get into it I go very deep and discover a lot about myself. I’ve been so restless recently and reading this article motivates me to keep going forward with my meditation even if sometimes it seems impossible to sit still. So thank you for your time in making this article!! Much love. honestly ive tried most of the things on this page and it didn’t seem to work. After trying many different stuff i figured out the key was not think of any peaceful or calm place/thing but rather just to find something you like and is significant to you whether its cars , fire or even water and just focus on it. I also have ADD and I am at the beginning of my journey with meditation. I very much want to feel more relaxed in my thoughts and not all over the place. I have not successfully meditated yet but I keep trying. My mind just simply won’t let go. Thanks a lot for sharing this with me Melissa. I appreciate it so much. Check out this article I wrote and see if it helps you.